The Amroad System is a fully digital system based on the SIP protocol. SIP transmits voice, video, text and data all together. In 10 years, SIP has become an accepted open protocol widely used worldwide ensuring excellent reliability and interoperability. The Amroad System integrates video entry system, access control, technical alarms and video surveillance. Even for multi-residence compounds, system integrators don’t have to install separate systems for each function anymore. All features of the Amroad System, from the location of a simple button to the design of a complex interface, are made to assist tenants, lobby staff and community managers in their daily life routine. Moreover the Amroad System has been thoughtfully conceived down to each detail to facilitate and speed up deployment in communities. SIP/IP devices are networked thru hubs that give an expandability covering all imaginable applications: from skyscrapers to multi-blocks communities, the number of users has no limits. Amroad devices are connected by only an Ethernet wire. Hence, the distance between them is not limited anymore, becoming virtually infinite (with optical fibers). In addition, in FTTH communities, the Amroad System leverages on existing optical fibers to minimize deployment costs. Wiring the Amroad System is incredibly straight forward to execute. 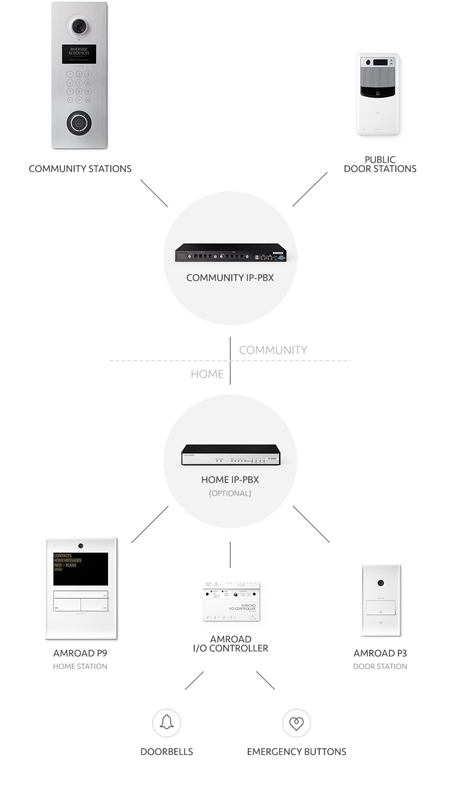 SIP/IP protocols are transmitted by only one Ethernet wire, drastically simplifying installations and maintenance. Moreover, Amroad devices are capable of using Power over Ethernet (PoE), which allows them to receive electrical power, along with data over the same cable. Thanks to their digital nature, all elements of the system are constantly improved and updated and new functions are added. The Amroad System is a platform that can be upgraded and expanded any time: it supports adding, updating and replacing products as community needs evolve. To watch videos of the Amroad’s System and products, please go to Amroad’s YouTube channel.